I recently learned the guitarist Henry McCullough passed away at age 72. Another Woodstock alum lost in this seemingly cruel year. Not to pile on here, but I learned this morning that bluegrass music pioneer Ralph Stanley died yesterday at the age of 89. Ralph and his brother Carter formed the Stanley Brothers and their Clinch Mountain Boys band in the 50s. The Clinch Mountain Boys were responsible for launching other welol known musical acts such as Ricky Skaggs and Keith Whitley. Today was a Santana I – IV kinda day. I had previously mentioned the acquisition of Santana I and Abraxas in this blog… but I didn’t ever mention Santana III, with the musicians known as the “Woodstock-era lineup” of Santana, Schon, Rolie, Brown, Shrieve, Areas and Carabello. III was Santana’s third hit record in as many years, their second #1 album and the first to feature a 17 year old Neal Schon on guitar. These three records have been among my favorites for as long as I can remember, although always in cassette, CD or other form… until finally had on vinyl within the past year. Their jazzy, bluesy, Latin-y mixed soul really suits a mild spring afternoon! 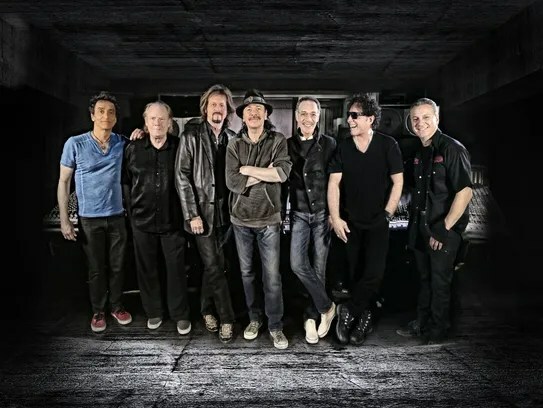 New to the mix is the 2016 release Santana IV… reuniting (as much as possible) the Woodstock-era lineup, minus Brown (d. September 4, 2000) and Areas (reason unknown) and including the bass player and percussionist from Santana’s touring band. I was excited to hear rumors of this album a year or two ago, but also nervous that Rob Thomas or some other pop A-hole would be enlisted to foul the thing all up! I’m happy to report that my fears were unfounded… with the only guest spot on the record filled by one of the Isley Brothers! This is a substantial album… four sides and clocking in at just over an-hour-and-a-quarter, and does contain a bit of what some might consider filler. But this is Santana filler, so I was OK with it! The album opener, Yambu, hearkens back to the classic album’s instrumental opening tracks announcing that this is, indeed, a new Santana record. The single released, Anywhere You Want to Go, features a Gregg Rolie (born this date, 1947 in Seattle!) vocal that sounds every bit as good as his 1970s tone. Listening to IV next to I-III, the former seems less youthful… less reckless. Polished of flaws by great studio production, IV feels like an airplane that has managed to climb out of the turbulence and the pilot has turned off the “Fasten Seat Belts” sign… you are free to wander around the cabin and the cocktail carts are on their way. 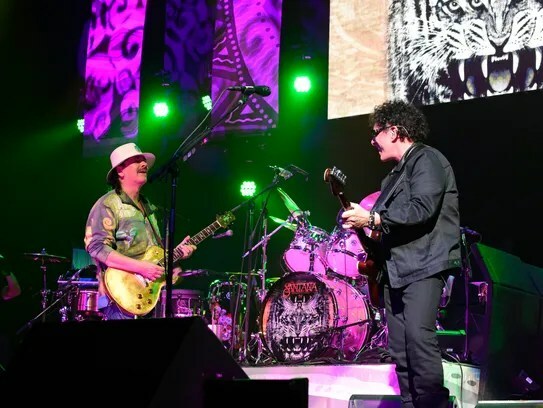 The real treat for me was the back and forth guitar interplay between Santana and Schon… Neal not letting Carlos rest on his laurels! I’m glad you persisted, Neal! An anniversary of local significance takes place this year; it was 75 years ago that the Columbia River’s Grand Coulee Dam began generating hydroelectric power. It was also 75 years ago that Bonneville Power Administration (BPA), tasked with providing cheap power to the rural Pacific Northwest, started planning an ambitious effort to promote this endeavor. The idea was simple propaganda; create a canon of music, film, stage play and other fodder for the social media of the day. Seed the message in the grassroots and grow the support of the people. Wrest control of this resource away from the capitalists and place the power in the hands of the people. But who could relay this message in a way that would resonate with the “common man” the way Will Rogers had managed to do in decades past? The BPA reached out to Library of Congress folklorist Alan Lomax for a reference he recommended but one person: Woodrow Wilson Guthrie. Woody Guthrie, a darling of the “new folk” left, was a popular radio show host, writer and performer… for as long as he could stomach staying put in one place. During a stint in New York in 1940, Guthrie was recorded by Lomax for the Library of Congress’ Archive of American Folk Song. land for Dust Bowl refugees. Woody, unemployed and living in California at the time, didn’t wait for a contract (or even a formal job offer). Hearing of the potential of the job from Lomax, he packed up his family in a soon-to-be repossessed Pontiac and headed to the BPA offices in Portland, Oregon. When Guthrie presented himself at the BPA, they weren’t sure what to do with him. The projects envisioned were still in the planning stages. The BPA eventually contracted with Woody for a months work. He was to write a song about the BPA project every workday and his pay was to be $266.66. Given a typewriter, some desk space and reference materials about the project and the area it was meant to serve, Woody started to write. Not trusted with the keys to a company car, he was given a driver and toured the region. He would play guitar and compose new songs in the back seat while on these road trips. He wrote of the people he met on those road trips (and those he invented). The people that came to build the Grand Coulee Dam and the people who came to settle in the paradise promised by it. He called the dam “the biggest thing that man has ever done” and seemed genuinely taken by the land and its folk and inspired by what he saw. He wrote about Dust Bowl farmers, Jackhammer Johns and the “Powder Monkeys” that “raise the country 10 mile high”. He met migrants that “come in with the dust and leave again with the wind”, hobos, ramblers, gamblers and the women that love them. He marveled at the salmon who “run every four years, just like the politicians”. 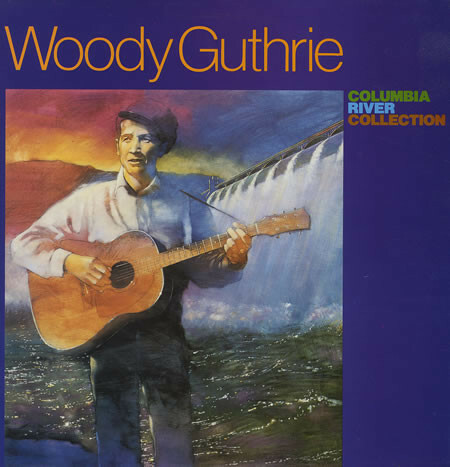 In all, Guthrie produced 26 songs in his time as a BPA employee, including Roll On, Columbia, Pastures of Plenty, Hard Travelin’ and of course Grand Coulee Dam. Typed, hand edited, carbon-copied in bureaucratic triplicate, these songs were dutifully submitted to the boss daily. Three were professionally recorded for the eventual soundtrack of the BPA documentary The Columbia. Others were recorded direct to acetate in a basement recording studio at BPA HQ. Never intended for release as a recording, many were thought lost to the dumpster after a bureau recommended retention period had lapsed (or purposefully during Red Scare times). Luckily, a BPA public affairs employee (and frustrated folk musician) was screening The Columbia 40 years later and noticed Guthrie’s name in the credits. This lead him on a years long quest to rediscover Woody’s time at BPA. Eventually three of the original acetates were recovered, including one with the only known recording of Guthrie singing Roll On, Columbia… one of his most recognizable tunes! These and other existing recordings of the Columbia River song cycle were finally released as Rounder Records ‎– 1036, Columbia River Collection. This album contains 17 of the 26 songs in the cycle, all performed by Woody, including the lo-fi acetate demo versions from the BPA recording sessions. 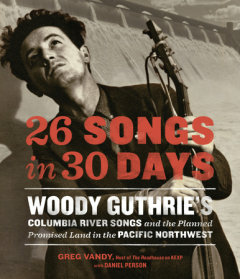 To commemorate Woody’s time in the Northwest, Seattle DJ Greg Vandy assembled all known stories and documents of this time in his new book 26 Songs in 30 Days: Woody Guthrie’s Columbia River Songs and the Planned Promised Land in the Pacific Northwest. It’s an easy read with plenty of historical photos and documents included. Not a rehashing of Guthrie’s early life and travels, the book includes just enough biography and local folklore to keep this month of 1941 in context. 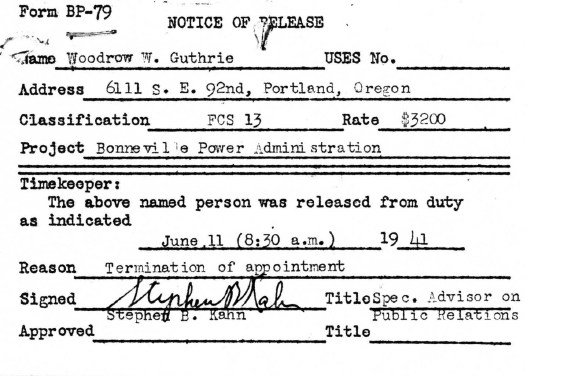 According to recovered BPA personnel files, Woody was served his “Notice of Release” on June 11, 1941, 75 years ago today. His wife and children would remain in Portland for the summer while Woody would hitchhike east toward New York, the Almanac Singers, fame and the eventual position as founding father of the folk revival of the 50s and 60s and induction into the Rock and Roll Hall of Fame. An acquaintance from BPA saw the folksinger… guitar slung on his back and thumb in the air, along the Columbia River road. He gave him a lift as far as The Dalles, Oregon, loaned him $20 and the rest is history. Roll on Woody, roll on! * Grand Coulee Dam is 5,223 feet long, 550 feet high, and contains about 12 million cubic yards of concrete. It raises the water surface 350 feet above the old riverbed and backs the Columbia River up 151 miles, forming Franklin D. Roosevelt Lake. The total storage capacity of the reservoir is about 9.6 million acre-feet. Those of you who are citizens band radio fans or love a good novelty song, you’ll know what I’m talking about. June 6th is the date that the fictional convoy of big rigs formed, rolling from outside of “Shakey Town” (L.A.) on toward “Flagtown” (Flagstaff), to Tulsa, Chicago and on to the Jersey Shore… and into the hearts and minds of America’s Road culture. The song, recorded by CW McCall in 1975, capitalized on the CB radio craze that was sweeping the States. The CB radio fad had its roots in actual world events… the oil embargo of the early seventies had caused fuel prices to skyrocket and shortages developed. To try to help conserve fuel, the government instituted a 55 mile an hour nationwide speed limit. Americans, proud of their huge gas-guzzling trucks and fast cars, quickly realized that drivers could communicate over the CB radio to warn other drivers of highway speed traps to skirt the 55 mile an hour limit and guide them to areas where fuel was available. A little activism later and truck drivers were banding together to block all Lanes of particular roadway is to allow the entire herd to exceed the speed limit. These events caused enough of a cultural buzz that songs about CB radios and truck drivers proliferated. Hollywood was close behind with such blockbusters as “Smokey and the Bandit” celebrating CB culture. Growing up, we had CB radios in most all of our cars plus base stations at home and portables for away excursions. On silently in the background, it was not uncommon for the thing to crackle to life with a friend or neighbor just checking in. So today I’m going to celebrate by listening to this awesome 2 record set entitled Road Music. So climb on in, buckle up and hold on! Let them truckers roll, 10-4! We went to our first concert of the summer season last night. The Little River Band played an indoor show at the Northern Quest Casino. It was a greatest-hits affair with only two unrecognizable songs played in the entire one hour and 45 minute set. The near sell out crowd was responsive and excited for Tuesday night and the band was excellent! I had previously written about seeing The Little River Band at my first concert experience; it was August 29th 1978, also a Tuesday. The event was billed as Spokane Jam, modeled after the successful California Jam concerts of the era. Although the 8000 crowd seemed huge to me it was a disappointment to the concert promoters and follow-up event was never held. I saw four bands that day; Evelyn “Champagne” King, The Little River Band, Bob Welch and Heart! It’s a fond memory and The Little River Band has been one of my favorite guilty pleasures ever since. Of course, none of these dudes were in the band I saw back in 1978… the lead singer and bass player was the closest, he joined the band In 1980 and sang the successful single The Night Owl. This year I decided to stop taking vinyl records to concerts in hopes of getting the artists to find them for me. Of course, at this concert the band decided to do a full-on meet and greet! We bought two T-shirts and a poster for the music room. So this one formative moment of my life has come full circle… an artist from my first concert experience in Spokane has again played in Spokane. If this is my last show ever at least I have closed the loop!